Dave Delaney sent out a call for a new logo to represent Geek Breakfast, a once-a-month gathering of geeks who meetup for breakfast. It started in Nashville at the West End Noshville but has since grown to include several other cities. The logo will accompany an all new universal Geek Breakfast Web site that will facilitate all the morning meetups. The decision to do this, according to Dave, is due to the frequent malicious attacks on the groups local Nashville site. I’ve posted Dave’s letter below for anyone interested in showing of their rockstar design skills. http://www.geekbreakfast.org has been attacked over and over again lately. Vandals keep hitting it, it’s very annoying. We are currently working on a solution. It’s going to be a universal site for all local Geek Breakfasts. I’ll have more information on that soon. 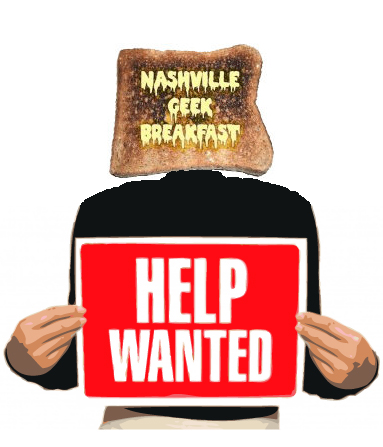 I’m reaching out to you, because I’m hoping some of you may want to help by creating a new logo for Geek Breakfast. You will be credited of course, plus your credit will link to your site or blog. What I’m hoping for is a logo that can incorporate a reoccurring element, like a cup of coffee or the sun. Something that others can take and make their own local versions from. The colors of the new site will be: light orange: ffcc67, dark orange: ff9900 and light green: b4d27d. You don’t have to use these, but the logo will need to fit the site style please. I think the breakfast department at your local grocery store will be very inspiring. I encourage you to please submit your logos to me: davemadethat AT gmail DOT com by the end of the month please. I’ve extended this offer only to the Nashville Geek Breakfast peeps, because this is where it all began. YOU make Geek Breakfast the international success is has become. Thanks! See you on June 25th.